We did receive considerably a lot of questions on how to resolve some problems with Cherry Mobile Flare 2.0 Android smartphone. 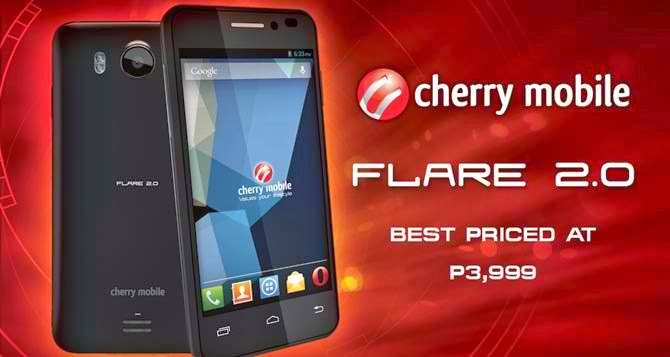 Cherry Mobile is a startup mobile phone and electronics company in the Philippines. One of the reasons why its products are so popular is because they are offered at considerably low prices plus good marketing strategies. Answer: Yes, I know about the phone because I'm a Filipino, too. You need to isolate the problem first. You said you already attempted to charge the phone, were you able to notice the charging icon on the screen? If you haven't seen that, odds are your charger is busted or your battery was misplaced. Remove the battery from your phone and then re-insert it. Make sure the interface touches the receptor. Plug the phone to the charger again, and the charger to the wall outlet. Check if you can see that the phone is charging. If not, find an alternative charger and use that. In case the charging icon shows up, give the phone at least 10 minutes to charge then you can turn it back on until it's fully-charged. Answer: Odds are there is a third-party app causing the phone to be stuck in boot screen or there are some corrupt data preventing the phone from booting up normally. The first thing to do is boot into Safe Mode. If you can boot into safe mode, it means that there is an app that causes the problem; you need to find that app and uninstall it. Start from the apps that you recently installed. However, if you cannot boot to safe mode, you need to boot to recovery mode and wipe the cache partition. That should do it. Question: I registered to Globe's Supersurf120 promo using my Cherry Mobile Flare 2.0 and I received the confirmation message saying I was already registered to the unlimited browsing for 3 days. But when I try to browse the internet, I can't connect to any website and Facebook is not updating either. What should I do? Answer: First, turn on mobile data from the Settings and wait at least a minute before you launch your internet browser or check your FB account. If you still can't browse the web after that, then there's a problem with the settings of your phone. You need to check the APN settings in your phone and change it to match the APN settings Globe provided to its customers. Also, you need to have at least P5 balance in your account to be able to use Globe's promo. Question: It's weird because I was able to use my phone's camera yesterday and today I'm getting the "Camera Failed" error message. What's the problem with the phone and how can I fix it. Answer: You may be able to fix the problem as long as it is a minor issue. There are two possibilities here: it could be a software problem or a hardware issue. If it's a software issue, there is a possibility you can fix it but if the camera sensor is the problem, you would need to have to seek help from Cherry Mobile's technicians. So, here's what you can do to isolate the problem. Go to Settings > Apps > look for Camera. Tap Force Close button, then Clear Cache button and lastly Clear Data button. Reboot the phone after that. Launch the camera application to see if it works, if not, proceed to another procedure. The second procedure is to wipe the partition cache. Boot to Safe Mode and you can do it there. If the problem still persists after this, you have to other option but to do a factory reset either through the Settings or through the Recovery Mode. But you need to backup all your data first before doing so. If all else fails, bring the phone to the authorized service center to claim your warranty if possible. Question: I often go to mall to connect to Wi-Fi and check my FB account but yesterday and today, I wasn't able to connect to the hotspot I usually connect to. Is there a problem with my phone? Answer: You know, I really cannot answer your question directly but you still need to isolate the problem. First, try to find another Wi-Fi hotspot you could connect to. If you can connect to other networks, it means your phone is just fine and the problem was with the network. However, if you cannot connect to any available network even if you've entered the correct credentials, there could be some problems with your phone. In this case, reboot your phone. Open Wi-Fi settings and 'Forget' the networks your phone have detected. Toggle the Wi-Fi switch from On to Off and leave it as is for a minute. Turn the Wi-Fi switch on again and let the phone detect available networks. Connect to the one you usually connect to and observe if you can connect. If you can't, bring the problem to the service center and have it checked. Do you have problems with your Cherry Mobile phones (any model) and don't know how to fix them? Don't hesitate to contact us through sebertech@gmail.com or leave a comment below and we will find solutions to those problems. Thanks for reading. Mabuhay and Pinoy! my flare 2.0 stuck on starting logo . i mean ndi sya natutuloy sa main screen . nag try na ko ireset sa recovery mode pero ayaw pa rin ee sabe ng mga tech my kailangan daw i download . anu po ba ung kailangan idownload? my flare s2.0 won't charge , I already ask the customer service personnel when they plugin the charger to their outlet it work fine, I went home and try to charge again , It won't work now ? Please help me I bought this flare s2 3 days ago and I was so disappointed of what I expected. Its in the Outlet / Built-in Charge port/ Battery or its in Charger itself. HELP ME QUICK RESPONSE PLEASE. I need to know what's the problem with Flare s2 model . PLEASE PLEASE PLEASE I'm Begging . i have the same problem.you have the solution now? I have the same problem also,, how can i fix it?? Can you help me..
my flare 2.0 stock in animation,how can i fix it??? Hi,my flare 2x automatically opens the wifi connection then download evrything without my concent. It also opens some applications even if im not touching the screen. I already hard reset it but the problems are still there. Please help me fix it. We got the same problem. DO U ALREADY RESOLVED IT ? My cm flare x lite cannot detect all the wifi, and.when I connect the wifi its stock on save only not to connected. Why?